Now before i get started, i know this post might cause some controversy, so before we start, please make sure you watch or read everything before replying. I can see a lot of people are getting excited over the ability to downgrade their ps4's in the future.... Well, i'm here to tell you why this isn't as great as it is being made out to be. Please feel free to view my YouTube video below if you would just like to listen rather than reading, otherwise you can continue to read below the video! So, essentially there is speculation of being able to downgrade PS4's to older firmwares. From what i have seen, there are a few legitimate methods in the works, and of course, many fakes too. Secondly, I would to address the legitimate methods which are being speculated and hinted in the scene. Many of you may have heard or fail0verlows recent release of PS4 Aux Hax. If you have not, I suggest you read about them PS4 Aux Hax 1: Intro & Aeolia, PS4 Aux Hax 2: Syscon and PS4 Aux Hax 3: Dualshock4. If you do not understand all that is written in there, this is fine. Essentially, the information they have released will aid developers greatly once it is put into practice by our current scene devs. As you know, Fail0verflow does not usually release completely made hax for end users to use, but they hint to the devs, how they can achieve a very desirable outcome. So you're all asking, why does this matter? Well it matters because essentially, this is the foundations to jailbreak any firmware up to the time of writing this. The methods of downgrading which are currently being hinted, are using Fail0varflows work to a certain degree, and thus implementing the methods used to jailbreak the system. Great right? In other words, when downgrading is made possible for all end users, it will no longer be required as the level of access required is the same level of access required to jailbreak the system..... So the need to downgrade is made redundant. Why downgrade when you can just jailbreak the latest firmware right? Well there are many reasons why dev's may not want it to be possible to jailbreak the latest firmware. This includes the fact that if people are on latest firmware, they may try gain PSN access which will cause a lot of ethical issues, if anyone is actually able to get onto PSN. But this can easily be avoided by releasing jailbreak for firmware just before the latest, that way PSN access is still revoked. Needless to say, PS4 day's are nothing like the PS3 days. A lot has changed, and the requirement to downgrade to get CFW is no more. Depending on the direction the scene takes, there may be a release for downgrading, or there may be future releases of newer jailbreaks implementing the Dualshock4 method Fail0vertflow has talked about in their write-up. At present it seems that the downgrade is useless but who knows? Maybe in the future it will be discovered that it could be useful for something since the bugs remain in the old fw versions and are patched in the newer ones. Hmmm i see where you are coming from, but see what you said there "update to latest, dump psn stuff, activate and other stuff I want, downgrade"
How is it possible to downgrade without a hardware solution if you do not have a kexsploit? And if we have a Kexploit, why downgrade if we can just jailbreak latest firmware? See what i mean. If we have hardware solution it would be different. I also see where you are coming from here, that's IF it ever becomes possible, but to my understanding, there will need to be a lot of work done in order to even patch your system to downgrade again. I can see where this might be useful for a dev to go to an older firmware to try break into different parts of the system, but i don't think it will be easy enough for end user, if even possible without a previous backup from when you were on an older firmware. As i stated above, i completely agree with this, it might be useful for unlocking the secrets of samu XD but a hardware solution is the only other reason a downgrade could be useful for end users, and i don't think this is currently possible. It may well be in the future, but for anything software related, a kexploit is needed end to end, so if one is present on a later firmware, why need to downgrade? You don't need kex if you have previously dumped required data. Only hardware to flash it back. Fair enough. But is anyone working on a hardware downgrader? I heard kiwidog was testing the downgrading and we wait for him to finish and see how the entire downgrade process will go. Sure, downgrade is useless nowadays for end users, I just think that understanding how to do it would still be an interesting thing, with the hope that in the future you do some discoveryes on old firmwares that they are be useful for end users also. if you call 5.07+ end users then yes, but this statement is not valid. 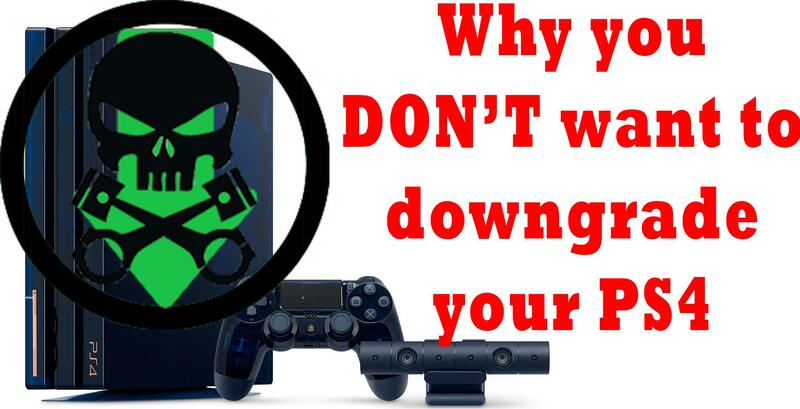 besides the "why you don't need to downgrade your ps4" is way too early to judge, because we still don't know for 100% sure the proper requirements to downgrade so from my perspective, and from perspective of a 5.07+ user it's way too early to say if it's needed or not. eventually we won't be able to jailbreak or downgrade anything. so enjoy what you have! I agree, i think it might help Dev's a lot. Plus having the ability would be nice incase you ever need it for something else.